Sign up for LPD Employment Opportunity email notifications! Must possess an unrestricted Ohio driver’s license (except for corrective lenses). Upon receiving a passing score, your name will be placed on a list of eligibles. Veteran’s credit of 20% (required by state law), will be granted to those individuals who show certified proof of Honorable Discharge pursuant to state law and the Local Rules of the Lorain Civil Service Commission prior to establishment of the Police Officer eligibility list. Must be able to pass an extensive background investigation relating, including but not limited to driving records, criminal records, alcohol and drug use, and financial responsibility records, polygraph, psychological exam, and physical exam. Undesirable conduct in the area of integrity, discipline, commitment, or reliability may cause an applicant to be disqualified. Must have a stable employment record. Instability may include the inability to maintain steady employment as well as gross abuse of standards, incompetency, or aberrant behavior during a single employment. Written Examination – The written portion of the exam is designed to test the candidate’s ability in the following areas: Ability to learn and apply police information, ability to remember details, verbal ability, ability to accurately complete forms, interpret maps and accident diagrams, ability to use judgment and logic. A study guide designed to be used immediately prior to the exam will be used. You must pass the written exam with at least 70% in order to take the agility exam. Agility Examination – The agility portion of the exam is designed to test the endurance and agility necessary to perform the duties of a Lorain Police Officer. The examination is pass/fail. You must pass the agility exam for your name to be placed on the eligibility list. Extensive Background Investigation – The background investigation includes, but is not limited to, previous employment, traffic and criminal checks, education, financial responsibility, and character references as previously outlined. Polygraph – A polygraph test is administrated to the candidate. Psychological Examination – The psychological examination includes the PRADCO Emotional Intelligence Index and oral interview. Additional testing may be required. Extensive Physical Examination – Physical examinations include a complete medical examination and evaluation. Drug Screening – Complete blood testing is performed to check for any illegal substance. The Lorain Police Department will provide approximately 700 hours of instruction in a Basic Police Academy . During this training, recruits receive a salary. Successful completion of the basic academy is mandatory for continued employment. Training includes showing a proficiency (through written examinations and/or demonstration) in the areas of Ohio criminal laws, First Aid/CPR, Firearms, Emergency Driving, human relations, communications, etc. Following the Basic Academy, specialized local training is conducted by the Lorain Police Department. Upon completion of both training phases, recruits are sworn in and begin a 16 week Field Officer Training Program where they receive on-the-job training from an experienced patrol officer. Employees authorized to perform the duties of a position classification one level above their own position classification are paid an additional 14% if the duties are performed. Officers who work Afternoon Shift are entitled to 35 cents an hour shift differential pay, and officers who work the Night Shift are entitled to 40 cents an hour. Sick Leave: 112 hours sick leave earned per year, unlimited accumulation. Upon separation from service, an employee with 25 years of service shall be paid 100% of a maximum of 960 hours of accrued sick leave at the employees base rate of pay. Holidays: Each officer is entitled to 112 hours of holiday time per year. Retirement Program: The Program is administered by the Police and Fireman’s Disability and Pension Board of Ohio. Police officers are excluded from the Social Security System. Longevity Pay: After 3 years of service, an officer receives $ 659.71 in longevity pay. Longevity pay is increased every year after that based on the number of years of service. Master Police Officer Pay, – achieved thru agressive training and assignments. Time and a half pay, or compensatory time received for Overtime worked. Officers receive the above as initial issue. Thereafter, officers are provided with a yearly clothing allowance and it becomes their responsibility, excluding weapons and vehicles. Officers become eligible for promotion through time in service/grade, and written examinations. 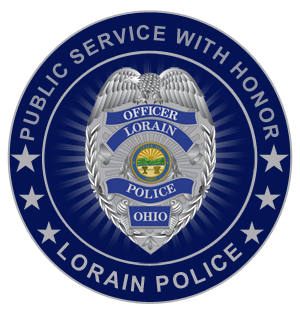 Want to know about employment opportunities with the Lorain Police Department? Subscribe to this list to receive email updates when we are hiring!